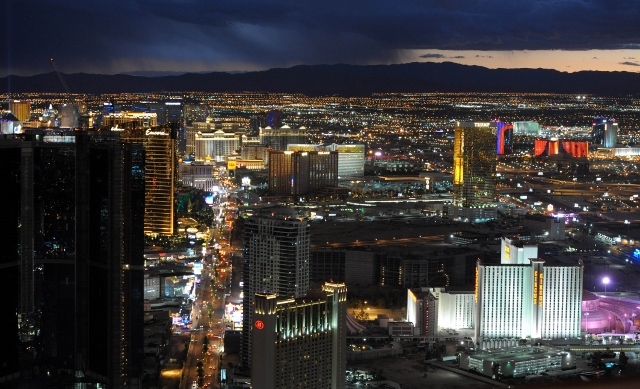 Las Vegas is one step closer to getting an NHL team. There was plenty of interest in NHL expansion from prospective ownership groups in cities around the United States and Canada, but it is believed only two groups were serious enough to submit an official application. Prospective ownership groups in Las Vegas and Quebec City confirmed that they’ve submitted bids Monday before the 5 p.m. ET deadline. That deadline was set as part of the NHL’s first phase of their formal expansion process. Ownership groups reportedly had to first submit their application by Monday, while also paying $10 million, $2 million of which is non-refundable. That fee existed to help separate the serious bidders from the pretenders in the application process. None of the three known groups interested in bringing a team to Seattle submitted a bid. The last hope was Connecticut-based businessman Ray Bartoszek, who had a proposal to build an NHL-caliber arena in the Seattle suburb of Tukwila. That group finally confirmed that it had not submitted an application for expansion despite reported communication with the NHL. There are no plans for the league to grant an extension for their deadline, however, according to Frank Seravalli of TSN.ca. It appears Seattle’s hopes of attracting an expansion team are dashed, though there’s the potential for relocation somewhere down the line. The league is currently only in the exploration stages of expansion. The application process was held to get a better idea of which markets truly serious about acquiring teams. NHL commissioner Gary Bettman has repeatedly said that opening this process does not guarantee the league will expand. Now it appears the NHL may only have two options if it wants to expand by 2017-18. In addition to Seattle, there were groups with designs on bringing a second team to the Toronto area. Las Vegas Hockey Vision, the group led by Bill Foley that includes the Maloof family, formally submitted a bid, according to Scott Burnside of ESPN.com. Foley filed the application under the name “Black Knight Sports and Entertainment LLC,” according to Burnside. Black Knights is one of the team names Foley had floated when he started doing his rounds with media. Quebecor, a Canadian telecommunications company that also owns TVA Sports — the NHL rights holder for French-language TV — among other holdings, also confirmed it has formally submitted a bid. The company also specifically noted that their aim is to bring the Quebec Nordiques back to the city. The Nordiques, of course, moved to Denver ahead of the 1995-96 season and are now known as the Colorado Avalanche. So it would be a new franchise, though naming the team the Nordiques appears to be the plan. Both Las Vegas and Quebec City were viewed as the most likely options for expansion because of the presence of NHL-ready facilities. A Las Vegas NHL team would play in the new arena being built by AEG and MGM Resorts on the Las Vegas Strip. It is expected to be able to hold about 18,000 spectators for hockey. Quebec City’s Videotron Centre was recently completed and will be able to hold 18,000-plus spectators for hockey. It is already slated to be the home of the QMJHL’s Quebec Remparts, but was built for the specific purpose of bringing an NHL team back to the city despite no guarantees from the league. The NHL believes it can charge new ownership groups expansion fees around $500 million. That money would be spread out around other member clubs, which is why there is particular eagerness to expand. The NHL has not set limits or minimums for expansion, so there is no guarantee that either or both markets will end up with NHL franchises, but this is a big first step. The NHL perhaps had expected more action during this application process, but even getting two viable markets still provides the opportunity for expansion fees around $1 billion. That’s awfully enticing. Still, both markets and ownership groups have to prove themselves in this next phase of the process. Quebec City, having lost the Nordiques 20 years ago, has the benefit of a dormant built-in fanbase. They only need to look west at the Winnipeg Jets and their success since the Atlanta Thrashers moved to the Manitoba city not quite 20 years after initially leaving to become the Phoenix Coyotes. The Jets have been a huge success in Winnipeg. Vegas is the great unknown, which may be why it is such an intriguing market for the NHL. Considering there are no other major professional sports teams in the city, this uncharted territory is a high-risk, high-reward proposition. Seems appropriate. Foley got permission from the NHL to run a season ticket drive, which started in February. To date, around 13,000 commitments have reportedly been made to purchase season tickets for a Las Vegas NHL team. That’s a pretty solid number considering people were forking out down payments for a team that doesn’t yet exist. In addition to the short-term financial windfall expansion would bring, it won’t mean much without long-term viability for both franchises. That’s no guarantee for either market, though both look especially promising. There are a number of other issues to sort through. The league is currently imbalanced between its two conferences, with 16 teams in the Eastern Conference and 14 in the West. Quebec City definitely doesn’t help conference symmetry, but Bettman has stated in the past that symmetry would not preclude expansion to eastern markets. Still, it’s something that will have to be addressed, perhaps in the form of yet another realignment. Regardless of the outcome, even the possibility of expansion presents excitement. The chances of seeing two new teams — one in a completely new market and one returning to an old, long suffering one — the expansion draft and everything else that this kind of thing brings, these are interesting times for the NHL and its fans.